A Charles Giuliano Photos image of Tom Rush at work. Occasionally a simple action sets a need in motion. A couple years ago a college friend sent me a CD of folksinger Tom Rush. This entertainer’s music first broke into our lives back in 1966, hung in there until graduation, and then evaporated as we moved on. Competition with job, kids and new directions pretty much locked Tom Rush out of our daily routines. But fifty years later, the brand new CD woke me up. Not only was our musical hero from university days still alive, but he was also, still, at the the top of his game. We decided to go see him again. On stage, Rush is a quiet conversationalist. He talks to the audience, and snares them into the context of his next song with the finesse of a master salesman. His modesty hides his greatness in the genre. Launching his career along with icons like Bob Dylan, Joni Mitchell, James Taylor, Eric Von Schmidt, Jim Kweskin, Richie Havens, Fred Neil today his body of work reaches across decades of accomplishment, from early blues to contemporary ballads. If “ballads” sounds corny, think stories, worries and wishes put to music and rhyme, about things and events on our plates every day. Isis Restaurant & Music Hall occupies a renovated theater from 1937 in the heart of West Asheville. 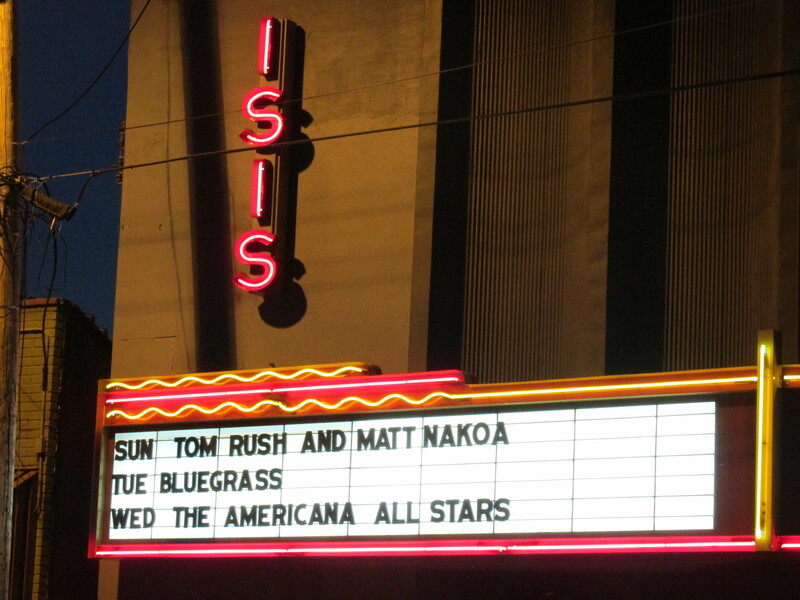 Last Sunday Tom Rush performed at the Isis Restaurant & Music Hall in Asheville, NC. Contrary to the those of many small cities across America, Asheville’s downtown is booming. In the west end, also known as the West Village, the Isis theatre is a fixture built in the 1930s, and renovated to its current appealing look with bar, restaurant and stage. Outside, the original marquee showcases the night’s act. Across the street is a guitar shop, with nearby pawn shop, grocery, village market, cafe’s and gas stations. The street is filled with cyclists and people enjoying their particular pursuits. While there was plenty of curb parking we chose to park in the grocery lot. There was a sign pointing to a steel box into which I folded eight dollar bills to keep my place. 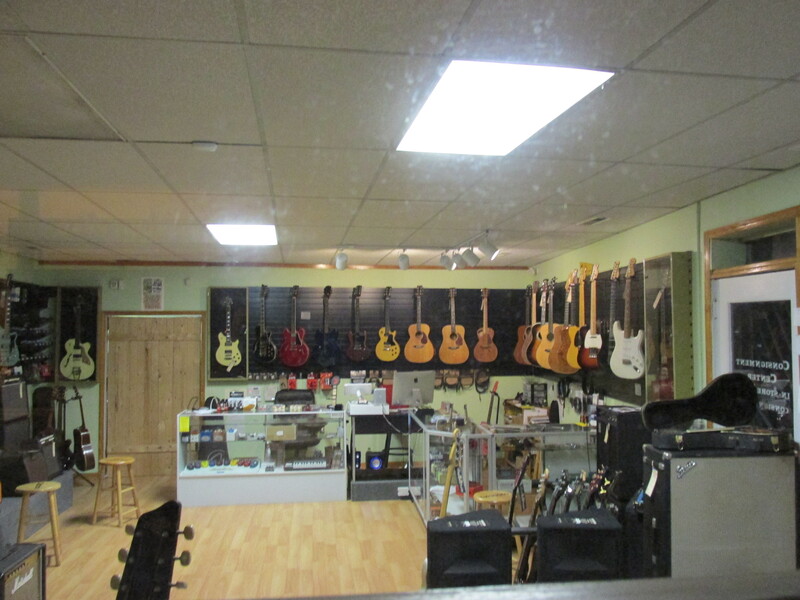 Across Haywood Road a guitar store stands ready to fulfill the next musician’s dream. Seated at our table up front, we looked at our hopeful neighbors, ordering dinner. The Isis is delightfully small. It seats about 50 diners and another 100 or so listeners on the main floor and in an upper gallery. It is a cool place, good food, with a restaurant out front which was packed when we arrived, 90 minutes before the show. Louise, the show scheduler came by our table to welcome us– a nice touch. Up on the stage, a young fellow is tuning instruments: pianos and guitar. He looks like a stage hand but in fact is Matt Nakoa who opens for Rush. I shake his hand, and ask him to pass a note to his partner, requesting a song. I can’t believe I am doing this but the opportunity can’t be lost to communicate with this giant. It helps when I add, “We saw you last September in Minneapolis. You guys were just great, thanks!” He got my name and finished his tuning, and left the stage. A few minutes later after Louise opens the show, Nakoa reappeared and delivered a virtuoso performance. His songs are rich, thoughtful and complex, with a voice that adds a layer of honesty to the words. At the keyboard, he is incredibly efficient. Not that he uses only one or two notes per bar, but rather that he uses all his fingers every second. I was reminded of the Bruce Hornsby sound: full barreled piano, active and melodic. Matt Nakoa could choose to be a powerful classic concert pianist, but he opted for the folk and jazz club scene, much to our good fortune. 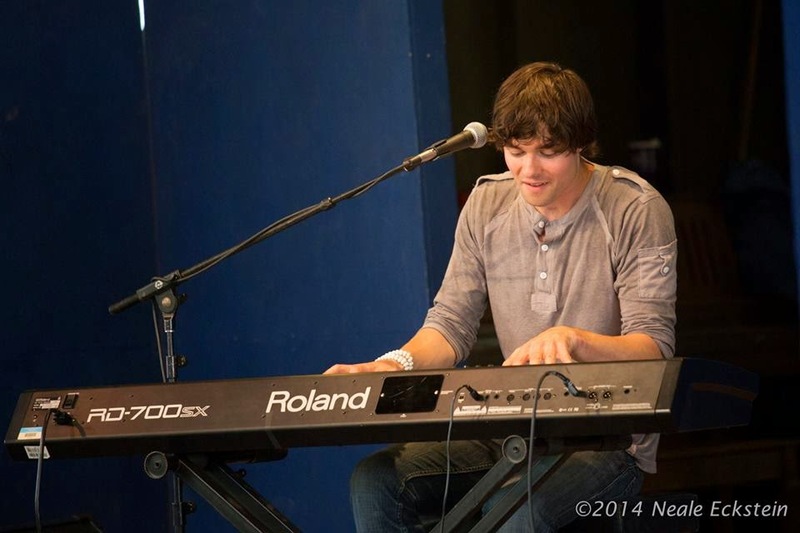 A Neale Eckstein image of Matt Nakoa unwinding a tune. Nakoa also played guitar, with a light and intriguing touch. He is left handed, playing a left handed guitar, but strung for a right hander. This forces an inverted chord formation which for most people would be like tying their shoes using a mirror. I am guessing he had to borrow someone else’s guitar in his learning, and the habit stuck. The result is golden: a unique and magical delivery. He delivered a half dozen songs, each original and lush in melody. You want to hear “Ballad of Jenny Kane”. Just as enchanting however was his patter between numbers. He plays while he speaks, reminiscent of 60s entertainer Mauri Hadyn who also spoke with the audience while she produced a continuous soundtrack of riffs. Tom Rush walks on after Matt’s introduction, and the crowd cheers for both singers. Two figures could not look less likely to work together, and that is the magic of this duo. We are faced with mop-headed Gen-x musical prodigy standing beside a crusty, smiling, white haired, git-picking balladeer. Unbelievable combination. Early on Tom Rush started a following that just won’t quit. His ’72 Columbia Records release. Our fascination is soon overcome by the quality of their product. Rush commands the room with his good nature and low-key, self deprecating introductions. He opens up his act with the confidence of a master woodworker unwrapping his blades, choosing one to carve a unique keepsake for the audience. Launching into “It’s Gonna Get Hot Tonight” the crowd responds enthusiastically to Rush, encouraged by his beat and voice, both strong and happy. In the background Nakoa has shelved the concert hall vibes to provide a wood-floor honky tonk sound that fills out the song perfectly. The audience tonight is a following that has grown organically over 5o years of performances. We drove 750 miles to see him. 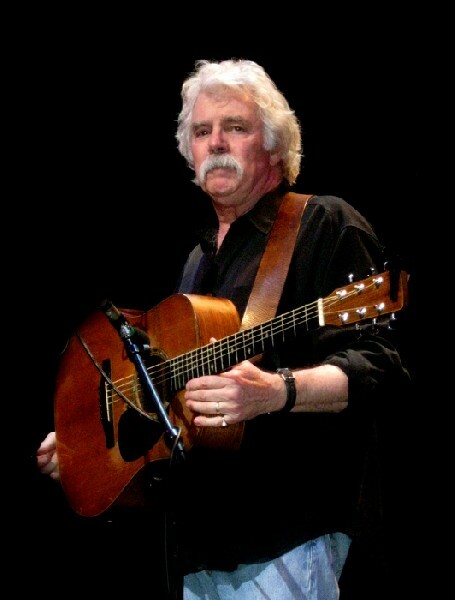 True to his brand, Tom Rush delivers amusement and satisfaction by way of his story telling, singing and playing. We know these songs, and they have legs. The lyrics are his, in perfect measure, with stories we want to hear. They are delivered by a voice that is both raucous and contemplative. He can change our mood in line or two, all the while polishing that finished piece of work for presentation. There is a side to Tom Rush which is remarkable, and it points to his generosity. Yes, Matt Nakoa adds a dimension to his music, but it is the reciprocal nature of Rush’s partnership that is giving a younger generation the benefit of his experience. He is hardly looking at the final days of his stellar career, with over 25 engagements scheduled in the coming months. Despite that, he has taken on the onus of sharing what he knows with a new, younger talent. Matt Nakoa has his own music and his own story, but he is following in the footsteps of a legend with full support. In big business, the CEOs always say to hire people smarter than we are, but it’s scary. Rush took that dare on Nakoa. Our kids should all be so lucky. 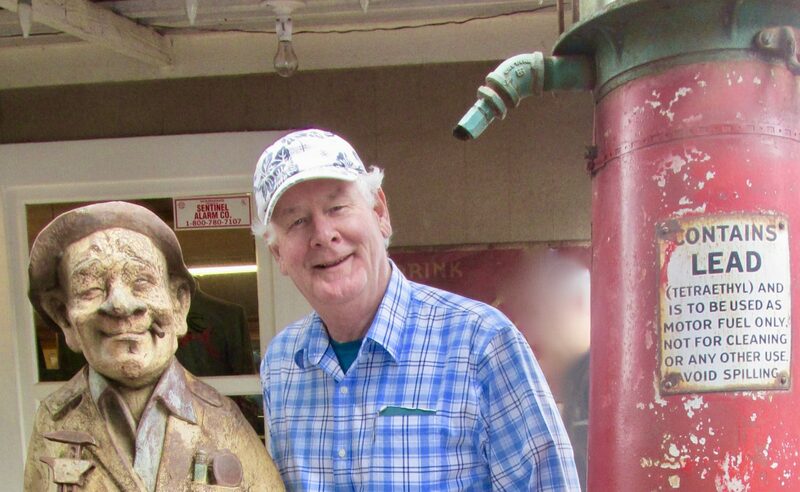 A look at Tom Rush’s website unveils another gift. While he has the usual display of story, news and events, he also has a page of FAQs . What’s with that? Countless questions from fans about how to play his songs, complete with guitar tunings. In our world, it would be like a master vintner unveiling his secret recipe for a knockout wine. Which leads to another puzzle in the Tom Rush narrative. Why does a self respecting folk icon tour New England and the west coast playing in small venues for only the price of a good steak? Celebrity has its costs, but modest ticket fees aren’t among them. I think the answer is that the man loves what he does, and he wants to share it. His audience loves him back. That is remuneration enough. And by the way, he called me out, and played my request. Thanks for reading! This show is what coffee house music and jazz clubs are all about. Who needs an auditorium for 20,000? I pass on some websites for your interest, and feel free to share! ← Why Don’t You Just Ask? Thank you! He is a key feature in our soundtrack. Phil—- Appreciate your writing, bringing color to the story. Speaking of a younger talent on the keyboard, if you can pull up Bobby Enriquez—album: Live in Tokyo. Find the track: Killer Joe. You’ll hear, possibly, the greatest jazz keyboard talent of all time. He exceeds Oscar Peterson. Thank you Grady, another virtuoso performance. I note that Killer Joe has massive downloads on iTunes. For the jazz buff he is a must. Thanks for writing. Phil, Thank you for sharing this. I can imagine the the goosebumps you felt when he played your favorite tunes. I heard Tom perform back in the 60s at a small venue called the Stoned Balloon in New Haven, CT. I’ve checked out some recent YouTube stuff but there is nothing like a live performance. For any music lovers in the Northeast check out the Infinity Music Hall in Norflolk, CT. It has all the attributes Phil found in Ashville. I didn’t get the goose bumps thing, but I think my wife grabbed my knee, I’m pretty sure. 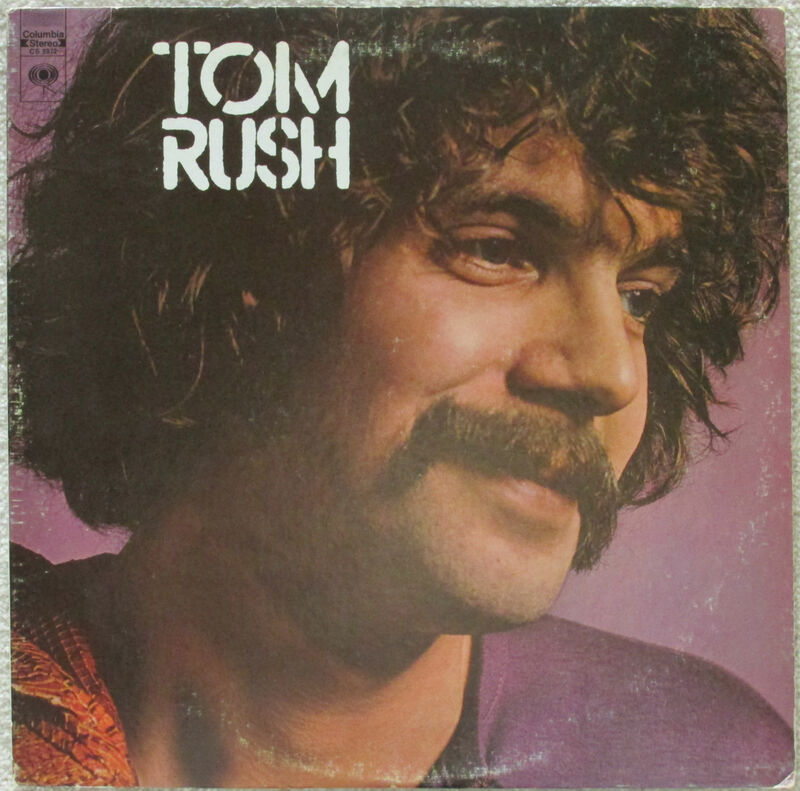 Live entertainment does sell records, and our family room is packed with them, including about six from Tom Rush. To me and my college friends he is the founding father of folk blues. Thanks for writing! Great piece…your descriptive writing made me feel like I was there! Thank you Pam, and one day you can be there! He’s worth the trip. Great essay, Phil. I actually discovered your blog from a link that Rush put on his old website. I’m a huge fan, too, and my wife and I just saw him perform here in Cincinnati. Got to talk to the man at intermission, to thank him for listening to some MP3s I had sent him that were done by a friend. Humble as ever, he said “I don’t think my opinion means a whole lot.” Yeah, right! Anyway, we had a great time, and other than not getting to hear “Hobo’s Mandolin” (one of my faves, but which he rarely performs), we both had No Regrets!! Hi Peter, thanks for writing. He has so many favorites I don’t know where to start, but I am envious of your conversation with Tom Rush. His new website is interesting, particularly the FAQs. I was amazed at the attention paid to them. As for my blog [posts, you will no doubt recognize that I tend towards direct mail and hard copy. So there may not be another Rush observation for some time. All the b best!